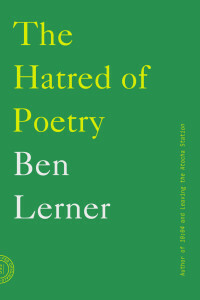 “I, too, dislike it,” Ben Lerner writes in the opening of his essential essay The Hatred of Poetry, invoking the beginning of Marianne Moore’s short, four-line poem “Poetry.” Moore’s poem continues with a wry sort of hopefulness: if one could read poetry with “a perfect / contempt for it,” she writes, they might find “after all, a place for the genuine.” Embracing a thesis that poetry is inherently limited by its own traits, Ben Lerner develops Moore’s idea about discovering “perfect contempt” in search of greater appreciation. It is a marvelous, illuminating read for both skeptics and self-proclaimed poetry aficionados; Lerner delves into our engagement and consistent disappoint with rhapsody and elucidates how our impossible expectations can lead to a mistrust — and even hatred — of the form. Great poets confront the limits of actual poems, tactically defeat or at least suspend that actuality, sometimes quit writing altogether, becoming celebrated for their silence; truly horrible poets unwittingly provide a glimmer of virtual possibility via the extremity of their failure avant-garde poets hate poems for remaining poems instead of becoming bombs; and nostalgists hate poems for failing to do what they wrongly, vaguely claim poetry once did. 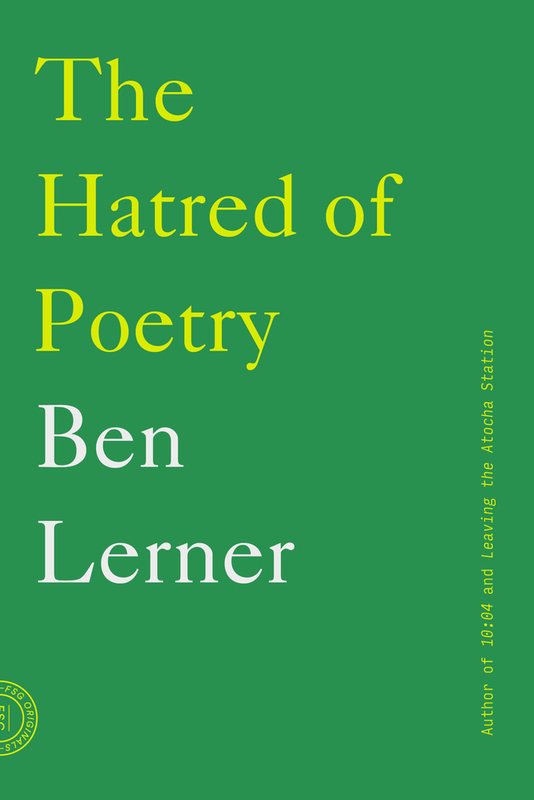 In just 80 pages and with an impressive array of critical examples, Ben Lerner achieves a cloud-clearing clarity that manages to elevate poetry from its swamp of expectations and under-appreciation. By searching for the limits of poetry and that vague, transcendent threshold across which a poem would truly succeed, Lerner forms a set of boundaries to better understand its shapeless nature. Lerner’s tone makes this analysis all the more effective, which strikes a remarkable balance of criticism and congeniality throughout the essay. His writing is approachable, possessing erudition without standoffishness; for something that hums with the aura of a takedown piece, The Hatred of Poetry is a welcoming, inclusive surprise. Lerner delves into our engagement and consistent disappoint with rhapsody and elucidates how our impossible expectations can lead to a mistrust — and even hatred — of the form.